Ξέρεις ελληνικά; Τότε μάλλον κατά κάποιο τρόπο... ξέρεις και αγγλικά! Το παρακάτω άρθρο είχε δημοσιευτεί πριν από καιρό σε βρετανικό περιοδικό τέχνης (;) Αξίζει το κόπο να το διαβάσεις...! "The genesis of classical drama was not symptomatic. Aneuphoria of charismatic and talented protagonists showed fantastic scenes of historic episodes. The prologue, the theme and the epilogue, comprised the trilogy of drama while synthesis, analysis and synopsis characterized the phraseology of the text. The syntax and phraseology used by scholars, academicians and philosophers in their rhetoric, had many grammatical idioms and idiosyncrasies. Eventhrough the theaters were physically gigantic, there was noneed for microphones because the architecture and the acoustics would echo isometrically and crystal – clear. 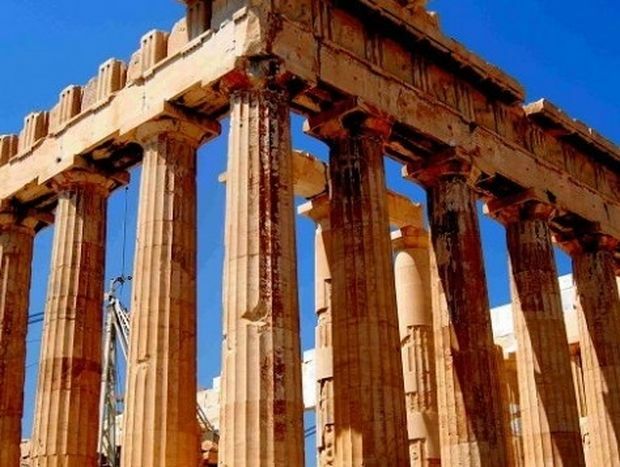 Many epistomologists of physics, aerodynamics, acoustics, electronics, electromagnetics can not analyze – explain the ideal and isometric acoustics of Hellenic theaters even today. There were many categories of drama: classical drama, melodrama, satiric, epic, comedy, etc. The syndrome of xenophobia or dyslexia was overcome by the pathos of the actors who practiced methodically and emphatically. Acrobatics were also eup3horic. There was a plethora of anecdotal themes, with which the acrobats would electrify the ecstatic audience with scenes from mythical and historical episodes. It is historically and chronologically proven that theater emphasized pedagogy, idealism and harmony. Paradoxically it also energized patriotism a phenomenon that symbolized ethnically character and phenomenal heroism."